Spinata Grande is one of the latest slots to be released by NetEnt Games. You’ll be singing ‘la cucaracha’ to this beautiful Mexican themed online slot. 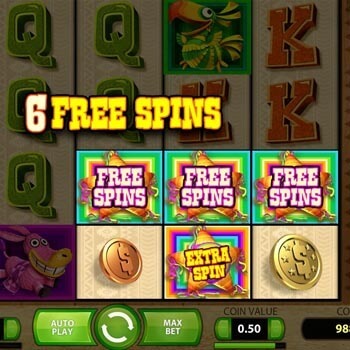 The festive piñatas and colourful card symbols all make for an unforgettable slot experience. Get on down to Mexico and party in style. Spinata Grande’s stunning animated graphics will make you feel as though you’re really there. Bask in the sunny settings as you watch the little cars and people wonder past. If you like Mexican culture, or even Spanish music, then you will love this slot. You’ll be feeling even more festive when you discover all the winning opportunities. Line up the gigantic sombreros and piñatas and get ready to watch the £££’s roll. Double or triple your wins, so you’ll have extra to spend on those mojitos! The larger than life symbols are but a taste of the unique and exciting features to come. Double or triple those wins! Spinata Grande’s humungous symbols are not just there for looks. They are that big so that they can cover several positions, which increases your chance of hitting the jackpot. The massive symbols can cover 2x2 reel positions, or 3x3 reels positions. This helps you take advantage of the full range of pay lines - and there are a LOT of them! Spinata Grande has a Grande 40 pay lines. You know you’re onto a winner. Before starting play, you can adjust your bet by using the Level button, which alters the amount of coins. The Coin Value option, lets you regulate the coin size, with a minimum of 0.01 and max of 1. There’s also a Max Bet feature, which spins your reels at the highest bet in your current coin value. And of course, no great game would be complete without an Auto Play button. Spin those reels automatically, whilst you sit back and enjoy the festive Mexican vibe. There’s a Grande 40 pay lines! If you hit any of the colourful Star symbols, you get a set of Free Spins. Free Spins provide a Grande chance to top up your account balance with even more £££’s. 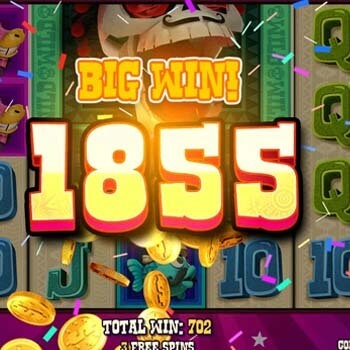 The Mini Slot bonus game can be retriggered during your Free Spins, and if you land additional Stars then even MORE FREE SPINS will come your way. Remember to watch out for the massive 3x3 Wild symbol, which can also pop up during your Free Spin bonus round. If you have a hot and spicy side, you’ll love Spinata Grande. Enjoy the festive Mexican atmosphere, along with all the slick game features and enthralling animations. The game is so fun and unique that you’ll have a cracking great time whether you win or not. That said, Spinata Grande provides tons of winning opportunities. Plus, with mobile play, you can access the game anytime anywhere. Andale! Andale! Give it a try!